The U.S. Dept. 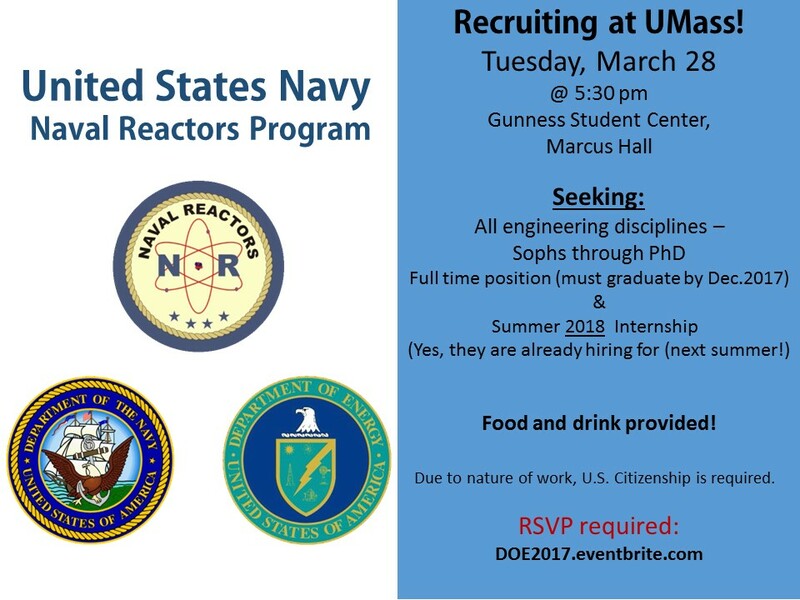 of Energy/NAVSEA -Naval Reactors Program is recruiting at UMass Amherst! Both opportunities are located at the Naval Sea Systems Command (NAVSEA), Naval Nuclear Propulsion Directorate (NAVSEA 08), in the Assistant Manager for Operations- Schenectady (AMO-SCH) Division located at the Knolls Atomic Power Laboratory in Schenectady, NY. Naval Reactors (NR) is the U.S. government office that has comprehensive responsibility for safe and reliable operation of the United States Navy's nuclear propulsion program. A single entity, it has authority and reporting responsibilities within both the Department of the Navy (NAVSEA, Chief of Naval Operations) and the Department of Energy (National Nuclear Security Administration). Due to the nature of the work, U.S. Citizenship is required.